Uveitis is a broad term that refers to inflammation of the uvea, the pigmented part of the eye comprising the iris, ciliary body, pars plana, and choroid. It is the most common inflammatory condition of the eye,1 and anterior uveitis is the most common form of uveitis in Western nations.2 Uveitis is divided into subtypes based on anatomy, clinical course, and pathologic findings.3 Anatomically speaking, inflammation of the iris or ciliary body is referred to as anterior uveitis, inflammation of the vitreous and peripheral retina is termed intermediate uveitis, and inflammation of the posterior retina or choroid is called posterior uveitis.3,4 Temporally speaking, an acute episode of uveitis is characterized by sudden onset and a duration of 3 months or less. Chronic episodes have a duration of longer than 3 months, with relapse occurring within 3 months of discontinuing treatment.3 This paper focuses on the more common acute anterior uveitis (AAU). A thorough history and ocular examination are the mainstays of diagnosis. The history should cover the duration and degree of symptoms, any previous episodes, and the possible presence of associated underlying systemic disorders. 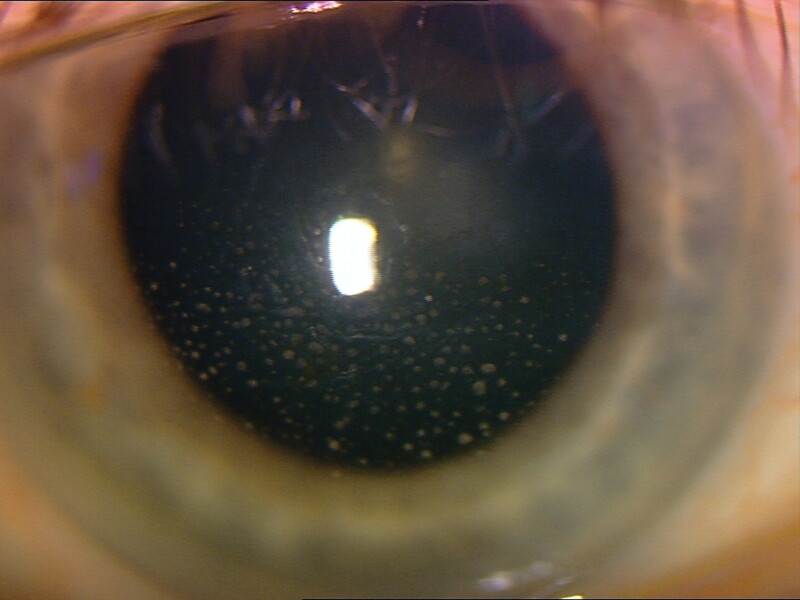 It is also essential to rule out mimicking conditions, such as keratitis, secondary spread from posterior uveitis, episcleritis or scleritis, acute glaucoma, problems associated with contact-lens usage, recent ocular surgery, and chronic anterior uveitis.7 Masquerade syndromes, including primary intraocular lymphoma, leukemia, uveal melanoma, retinoblastoma, metastatic lesions, and paraneoplastic syndromes, must also be considered. The presence of associated underlying conditions should be investigated and other health care professionals involved, depending on the diagnosis. If AAU is suspected, prompt referral should be made to an ophthalmologist for assessment and initiation of treatment. Treatment is aimed at inflammation control, prevention of complications, and symptom relief. Topical corticosteroids should be used aggressively to quickly bring inflammation under control and to soften and break any posterior synechiae. A loading dose of prednisolone is typically provided, followed by hourly instillation for the first few days. Instillation must be continued during the night with a cortisone ointment.7 Steroid treatment should last 6 to 8 weeks depending on clinical response,7 ending with a slow, tapered reduction. As side effects include raised intraocular pressure, treatment should be administered and monitored by an experienced ophthalmologist. Nonsteroidal anti-inflammatory medications are not as effective as steroids in the treatment of AAU13; if inflammation is uncontrolled by topical corticosteroids, periocular or systemic corticosteroids should be considered. Acute anterior uveitis is a common inflammatory condition of the eye. Careful history and physical examination should rule out mimicking conditions and distinguish AAU from other forms of uveitis. Corticosteroids and cycloplegics are the mainstay of treatment and should be administered by an experienced specialist. Frequent follow-up is necessary. The presence of associated systemic disorders should be investigated and treated.
. Causes and frequency of blindness in patients with intraocular inflammatory disease. Br J Ophthalmol 1996;80(4):332-6.
. Uveitis: a global perspective. Ocul Immunol Inflamm 2002;10(4):263-79.
. Standardization of uveitis nomenclature for reporting clinical data. Results of the First International Workshop. Am J Ophthalmol 2005;140(3):509-16.
. Wills Eye Hospital atlas of clinical ophthalmology. 2nd ed. Philadelphia, PA: Lippincott Williams & Wilkins; 2001.
. CURRENT medical diagnosis and treatment. 48th ed. New York, NY: McGraw-Hill Medical; 2009.
. Acute anterior uveitis and HLA-B27. Surv Ophthalmol 2005;50(4):364-88.
. Acute anterior uveitis in primary care. Clin Exp Optom 2007;90(2):70-82.
. Granulomatous anterior uveitis associated with bimatoprost: a case report. Ocul Immunol Inflamm 2003;11(1):67-71.
. Duane’s ophthalmology. 15th ed. Philadelphia, PA: Lippincott Williams & Wilkins; 2009. p. 227-8.
. Oxford handbook of clinical specialties. 7th ed. Oxford, UK: Oxford University Press; 2006. p. 430-1.
. The development of complications in patients with chronic anterior uveitis. Am J Ophthalmol 2005;139(6):988-92.
. Degree, duration, and causes of visual loss in uveitis. Br J Ophthalmol 2004;88(9):1159-62.
. Topical indometacin, a prostaglandin inhibitor, in acute anterior uveitis. A controlled clinical trial of non-steroid versus steroid anti-inflammatory treatment. Acta Ophthalmol (Copenh) 1991;69(2):145-8.
. Uveitis: fundamentals and clinical practice. 3rd ed. Philadelphia, PA: Mosby; 2004.